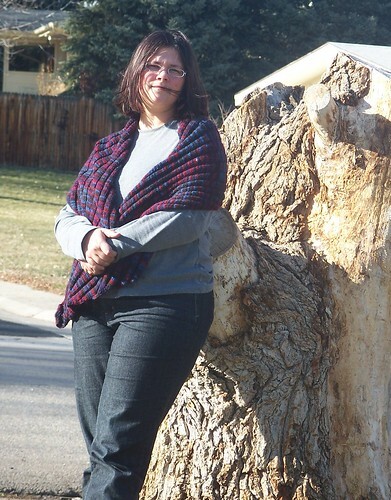 OK, so there has been some serious knitting!!! 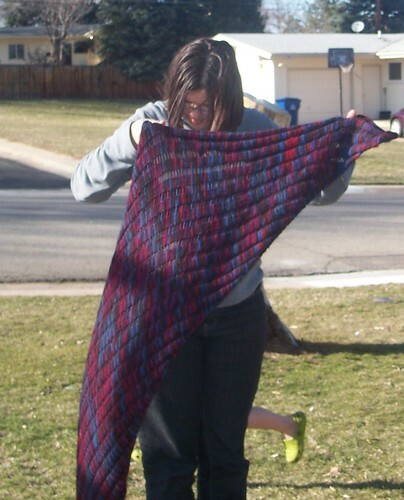 Yes, apparently if every other knitter jumped off a bridge…well maybe not that, but I did come late to the Clapotis party, and I have to say, I DID love knitting it!! Made in just 8 days it is my all time favorite now, since it is a scarf and a wrap and a mini blanket for a cold movie theater…… If I had known how much I would love this thing I would have made one a long time ago, as it is I bought a couple skeins too many for this one, they may go back to Michaels for another color so I can have two. This particular one is made from good ole Patons classic Merino in what is one of my all time favorite colorways as it goes with practically EVERYTHING I wear, there is red, brown, purple, black and blue in this jumble of colors, and somehow they made it look amazing. This is a TV knit so if you are looking for challenging, or exciting look elsewhere, the only satisfaction you get from this in terms of something different is dropping those stitches every twelve rows. For me it was satisfaction enough. If you are considering your own Clapotis, may I warn you that classic merino is sticky, so you will have to work to drop the stitches, but I found it so well worth it!! But wait…that’s not all for tuning in today you also get a peek at this delightful trio…. 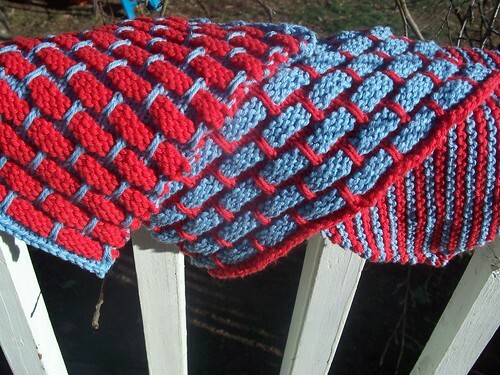 two ball band dishcloths and one garter stripe bias knit dishcloth from peaches and creme, red and light blue..Something about these dishcloths is just…addictive, they are like dishcloth crack…. anyway, this set is going to grandma, she is the only person I know without a dishwasher, and I think she might appreciate them. Now check out our eggs…..
….see how they sparkle just like in the picture? 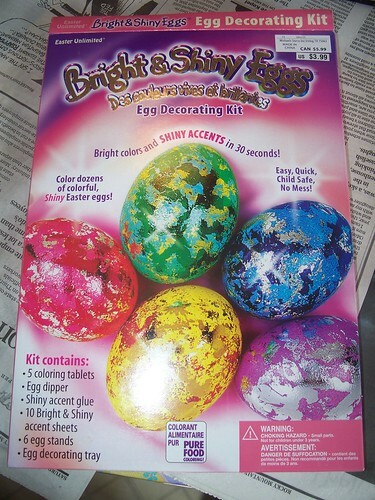 Yup, after all the years of getting egg breaking disaster kits, or mess making disaster kits, or ugly eggs kits, this one was a winner, not very messy, and nice results. Like most dye the pink and purple dyed the fastest, so even though my dye helpers this year were both boys, I still ended up with a high percentage of pink and purple eggs. 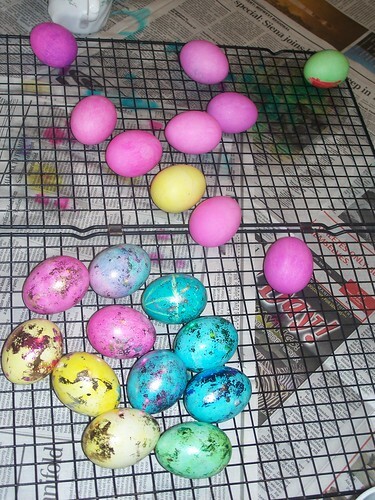 To give credit where credit is due, virtually all of these were dyed by the boy method of dip it in and take it out 🙂 I finally broke out the crayons just to slow them down, but still two dozen eggs dyed up in about two minutes!! Me and Steve Jobs though? we have issues. Some time ago I bought a shuffle, one of those cute little ipod clippy MP3 players, and we had a real fling, me and the shuffle. But then something happened. Something that almost tore us apart for good. The dock came between us. I tossed the little dock into my morning bag as always one morning. When I got to work I pulled out the dock with the intent of loading a couple new knitting podcasts and I discovered to my horror that the prong had BENT. And yes, I did try to bend it back before I got to the desperate step of taking it apart…..
Once it was apart though, I decided that perhaps apple design is not all they say it is. You can’t see it well from this picture, but the prong being at a 90 degree angle to the body of the charger is design flaw number one. I am not sure there is plastic tough enough to hold that thing at that angle and survive day to day rough treatment of other chargers. Granted Apple may not have intended it to withstand such day to day use, but shouldn’t they have told us that? Second all the wires between the board and the little prong are HAIR THIN, and have NO SLACK, so that when the prong is displaced the chance of the wire surviving intact are slim to none. For what it was worth, I did visit the Apple store online with the intention of purchasing another dock, but a new dock was $30.00 and a new shuffle only $45.00! Then to add insult to injury, I found the dock had overwhelmingly negative reviews at the Apple store!! So, my five year old now has a shuffle of his own because I refuse to pay $30.00 for a dock. We are sharing the dock it came with, he is loving his shuffle, and I found an aftermarket source for a better designed dock, WAY cheaper. Gotta love technology. But knowing about the overwhelmingly negative reviews of the dock I wonder, why has the guru of design not addressed them? Why is there no alternate charger design? sigh. Trust not the so called wizards of technology, for they are naught but frauds. Anyway, last time I left you I was headed to a yarn store where there was a sale, and I did indeed indulge! Anyway, enough of my babbling today, tomorrow a meme, and a FO, actually the FO would have been today but no decent picture yet!! I really think perhaps sarcasm doesn’t work in a title. Read it again only sarcastically to make me feel better eh? Thursday is just turning out to be an entirely uncooperative day. Boy suffered the onset of nightmares last night, which brought him and a herd of stuffed animals crawling into my bed at ridiculous:30 am, fortunately he did decide to sleep after the moving process was complete.. so there is that. Walked outside this morning to a less than delightful burst of COLD, the kind of cold that freezes your nose hairs and makes you want to turn around and go right back to bed. The sun is shining though, so I have hopes that it will warm up a *little*. On a brighter note, I just got an email about a sale at a yarn store, close to work, but far away from home.. the sale starts today, and they open at lunch time. So I plan on fully consoling myself over lunch. It is the first Monday in March, and I have got to tell you it feels very strange dating things March already…..it seems like if I blink I will be writing December on things….. The weekend was a touch like the weatherman predicted….Saturday was AMAZING and WONDERFUL and NICE…. 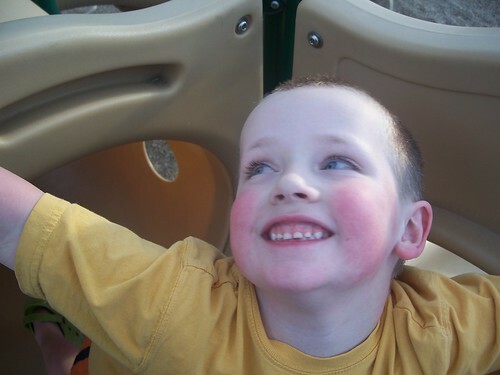 I took DD out shopping, an experience to say the least, but our shopping trip was pretty successful, and it was so nice driving around with the windows down! 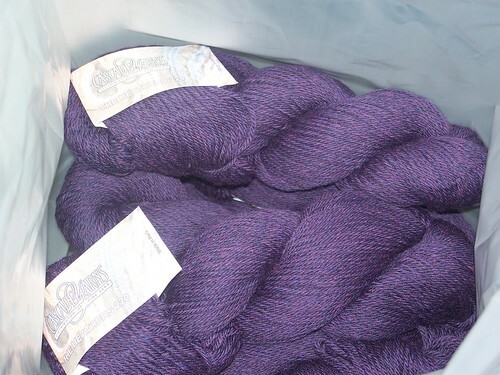 We had a car picnic, and I ordered yarn at The Cottage Yarn to make a flutter sleeve cardigan…..a nice kind of lavender grey color that for some reason I loved instantly. I didn’t go with the recommended yarn, but am subbing a beautiful cotton acrylic blend…easier on the wallet :0) I really liked this sweater when I first saw it, something about it just sucked me in… then I read a lot about how people DIDN’T like it, in fact some thought it was AWFUL, I know I shouldn’t care what others think, but I have found with this knitting stuff, sometimes it is good to listen to the voice of experience, so I had doubts….THEN I saw it on the knitting daily models, and I pretty much decided that this was going to be my next project. Yarn is ordered (which is good, Maybe I will actually finish something a second pomotomus in between) and I am a happy camper! I do have knitting – very happy knitting – I made a ballband dishcloth, brought to fame in part by the lovely ladies of Mason Dixon Knitting. I like making dishcloths, although I am not sure why, and I love cotton yarn – this is like the supreme dishcloth pattern though! I held off making them because I had seen pictures where they looked like they were kind of scrunchy and wouldn’t lay flat, and I was a little worried about making an ugly dishcloth….no need to have worried…. 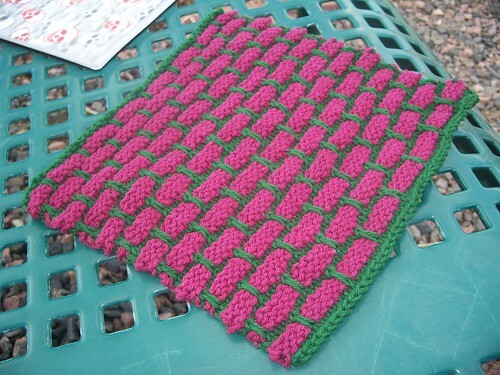 Barney the dishcloth is already working hard in my kitchen… and will have an opposite twin soon. I really think it is a little sick how much I love this dishcloth. Indoors it looks like wine and forest green, out in the park where it was cast off and photographed, it is totally Barney the Dinosaur Purple and Green. I have got to get me an Ott light!! As of now I am offering no account of Sunday. It snowed. Lots. ’nuff said. But how about one last Saturday picture to end things on a high note….